This evening, Epic and I went to our very first conformation fun match together. I was very nervous about the whole thing. I wasn’t worried about how we would do and more worried about the judgy-ness of the people around us. As we waited our turn it occurred to me that my nervousness was a result of not really understanding the game or more to the point, not knowing how to “win”. In dog sports like rally, agility and even flyball, there are very clear criteria for qualifying. You know exactly what you need to do and if you do those things, and a judge sees it, you pass. There is subjectivity in dog sports (that’s why we have judges) but performance evaluation is mostly objective. In conformation, even if a dog is well presented (stacks nicely, shows teeth without a fuss, gaits nicely) whether you “win” or not is totally dependent on 1.) how the other dogs in the ring look compared to yours and 2.) the judge’s opinion of your dog’s structure and movement. as it relates to the breed standard. A person can train all they want and have a perfectly presented dog but if the judge doesn’t like what they see (or if they like another dog in the ring better), there’s nothing you can change in that moment to “win. Nothing. In short, I have very little control over the outcome in Conformation and that makes me nervous. Epic did very well. I kept her busy during the long wait, she showed her teeth with limited fuss and she did the gaiting, albeit with her nose stuck to the mats. I used food to lure her nose up and knew that there was really no way that the judge was getting a good view of Epic’s movement. I did not get the impression is was avoidance sniffing, so much as just being overwhelmed and distracted with the smells present. Over the next few weeks we are going to work on gaiting more and on ignoring distractions – both of which are easy enough to teach, I just have to do it. I had the day off today so Epic came into town for a weigh-in with me and then hung out in the car while I ran errands. 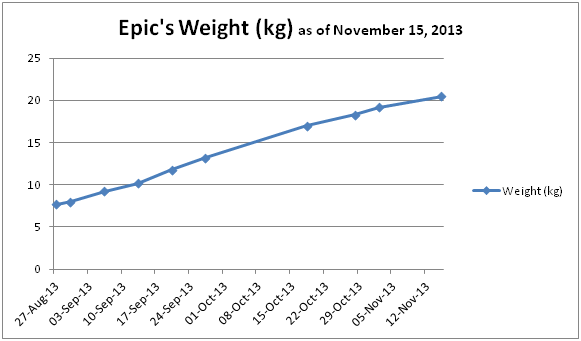 Since she came home, Epic has been gaining weight slowly and steadily, which is what I want to see. Bear is entered in an agility this weekend so Epic gets to come with us “for the ride”. She has her own crate set up plenty of chew toys to keep her busy. My goal for the day was for Epic to settle in her (covered) crate and for her to get used to the routine of dog shows which is (crate, wait, pee, wait, work – repeat!). She did very well with a little whining but no cranky barky fits even with some rather vocal dogs around us. She peed and pooped in a strange place which may not sound like a big deal but many dogs hold it until they explode in new environments and that can’t be comfortable or healthy! since she is not “working” in the trial, her work consisted of walking around the environment, paying attention to me for cookies, playing tug and sitting nicely for cookies from others. Today was another fun day at the agility trial. We did all the same things we did yesterday but today we ran up and down the halls (conformation gaiting practice) and Epic got to climb the bleachers and watch some of the action. Today was not the best of days. This morning I ran into a Deer on the way to work. Epic was in the car with me and fortunately she was safe in her crate. Arranging insurance details took up most of my free time during the day so Epic did not get much of my attention or any training today at work. Later this evening while doing my nightly go-over, I noticed one of her ears is more than a little pink, the ear cleaner did I used earlier this week does not seem to be helping so I have booked a vet appointment for later in the week. I suspect she has an ear infection. Today, I was very brave. I left Epic at home while I went to work. This wasn’t completely my plan however the rental company was very specific about no dogs in the car so I need to be particularly careful about having either dog in there. It’s also high time we did this. She did not have to stay home by herself (Bear was home too) and she did get out during the day (Sean comes home at lunch) but it was kind of hard to leave her and my day was rather quiet without her. Sean reported that she was incredibly happy to see him, but clean and dry when he came home at lunch and after work. I had to teach a rally class tonight so it was 7:30 pm when I arrived at home. Sean had company over so he had them outdoors running around in the snow earlier and now both dogs were resting quietly in their crates, and a tad nonchalant about my return. I don’t think I need to worry about leaving Epic home in her crate anymore. Conformation showing can be frustrating but most people actually “lose” during a show and there is only one “winner” at the end, so if you remember that you have made progress. Epic is gorgeous!
) You are right Anne, only one person really wins! We don’t need a Best in Show. Enough points to finish is all we need and fortunately there are quite a few rottie puppies around that are Epic’s age so there are, at least, points available without having to place in the group!